Jasmine and Calendula Facial Oil. Beloved for its fast absorption and lightweight formula, and calming and soothing for unsettled skin. Jasmine oil rejuvenates and hydrates, whilst calendula promotes healing and regeneration. 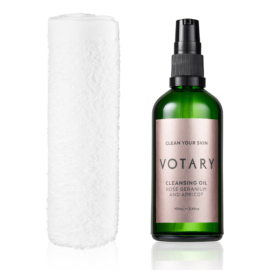 Rosehip and grapeseed tackle excess sebum, and apricot oil provides nourishment for fine, gentle re-tuning. Hydrating without clogging, it creates a flawless base for make-up and sunscreen. Put four to five drops onto your palms. Hold your palms to your face and take a moment to inhale the natural fragrance and let it settle your mind. Now smooth the oil onto your face and neckline using gentle upward motions. Use your fingertips to gently pat the oil into the area around your eyes. Be gentle with your skin – don’t pull or stretch – so that it retains its elasticity. Allow a moment for absorption, and now your skin is perfectly prepped for make-up, SPF. or sleep. 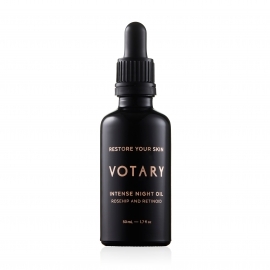 Votary Facial Oils work wonders when massaged into the skin. Just like the rest of your body, your facial muscles require exercise to stay healthy. Arabella reveals her top techniques in the video below for a great way to relax your mind and boost circulation to your skin.